There are a lot of photographers out their that I like. Of coarse some are better then the others. When I think about who shapes me, who influences my photographs, if you asked me in high school I would have said any photographer that shot for National Geographic. I wanted to be one of them. Now I would have to say that it is a few different photographer's, all for difference reasons. First is Ansel Adams for his command of landscapes and depth of field. 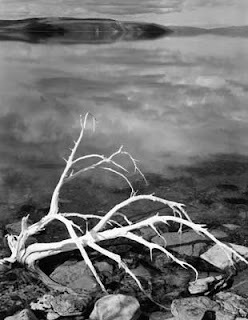 The picture to the left is one he took in 1950 entitled White Branches, Mono Lake. You are instantly drawn to the white branch because its bright and its the main focus. But when you step back, you can see all the way across the lake. Most of his pictures are like this. Each picture has a main focus but then widens into something more. Even more of what I found fansiting is that Adams was a musician before he was a photographer. His transition began when he met Albert Bender. Bender was the one who pushed Adams to publish his portfolio. What else that I love about Adams is that he used his photography as a voice for his activism. Adams loved the wilderness and the environment and he did his part to see it preserved. Another photographer I like is Annie Leibovitz. She shoots celebrities but she finds a way to show them in a true & artistic way. Her job at Rolling Stone Magazine fascinates me. It's amazing and sad at the same time, her photo of John Lennon. How John Lennon is naked and kissing Yoko shows that he is comfortable yet vulnerable at the same time. Also that he is loving. I want to be a studio photographer but I would also love to travel. I would love to be able to capture that moment that seems to show who a person is or the simple beauty that nature holds. I never had an impulse to work for a newspaper. I like having time to capture moments and not just shoot, keep shooting and then move on to another assignment. Thanks for commenting on my post. It's unique that you have 3 different photographers as your inspiration. Usually, it's just one person. They all are good photographers. Nice that you showed examples of their work. I forgot to mention Annie Leibovitz in my inspiration paper, she's really cool. I also like the photo of John Lennon and Yoko, that's one of those photos you can't forget for the way it was composed. I think it's funny how we have such different tastes in photography, I want to work at a newspaper and I've never had any want to work in a studio. I've seen your studio work and I think it's really good.